The old oaks cut down at the Lowe’s construction site in Albany are not going to waste. Instead their material will help young people in Albany high school woodshop classes learn new skills, and some of it may become sturdy furniture. 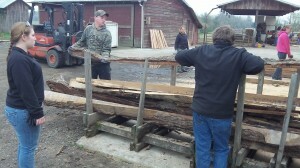 Lowe’s and its contractor had donated the oaks, some of them 200 years old, to a school program that saws the material for lumber to be reworked into various products. On Saturday, about a dozen woodshop students from South and West Albany High Schools turned up at the Kenagy Farm in North Albany and helped cut up some of the logs. Supervised by their teachers, Chava Neuhaus of South and Jeff Hawkins of West, students helped in the sawing, sweeping and stacking, along with Peter Kenagy, on whose farm on Nebergall Loop the logs had been stored, and Mark Azevedo, a member of the Albany Tree Commission. This program has been supplying school classes with raw material for several years. Hawkins made a rough guess that the donated value might be around $100,000 by now. 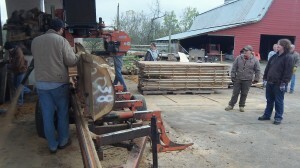 Justin McMinds, the owner of Logs to Lumber in Albany, was the operator of the diesel powered sawmill. 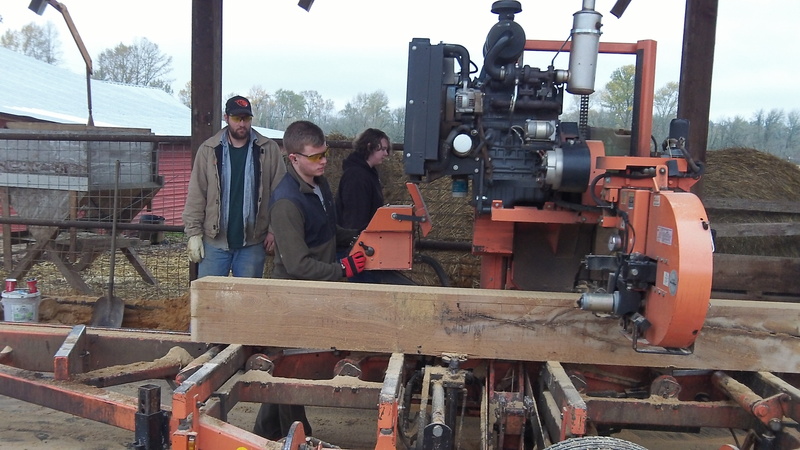 Logs to Lumber has been at the center of the Sawing for Schools program since its inception 5 1/2 years ago. There would not be a Sawing for Schools program without Logs to Lumber. We milled around 3,500 board feet of lumber today and still have around 1,500-2,000 to go. The sawn lumber will go into my drying kiln at Kenagy’s in the next week or so and will take around 5 weeks for each load to dry. (Two loads so far have been sawn).The remaining wood will be milled by the first of the year. 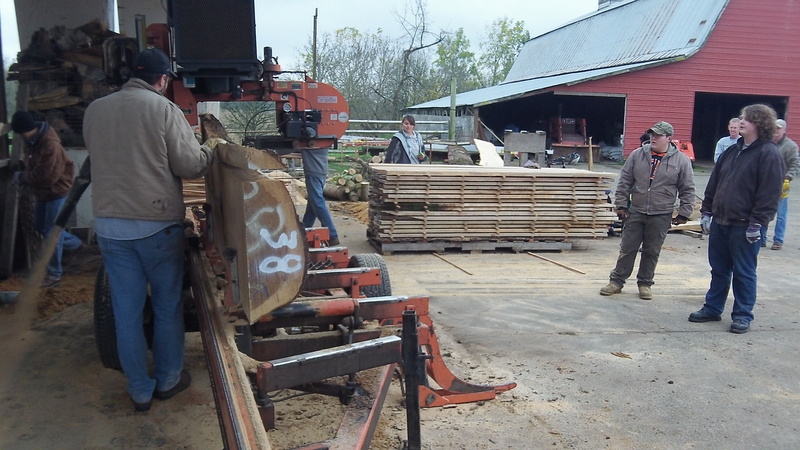 Several professional woodworkers will be using some of the wood to build furniture along with advanced students. One of these professionals is Brendan Alvister from Portland, who attended today’s session and brought along a custom designed Greene and Greene style walnut stool to share with the students. We are planning on holding an auction next fall for the built pieces, and all proceeds are going to habitat restoration starting with the East Thornton Lake Natural Area. Super awesome. Thanks Mark for all the various work you do!